THE MEDI-CENTRE WARRINGTON : WELCOME TO ONE OF THE NEWEST AND PERHAPS MOST "CONNECTED" COMMUNITY BASED HEALTHCARE PREMISES IN ENGLAND. 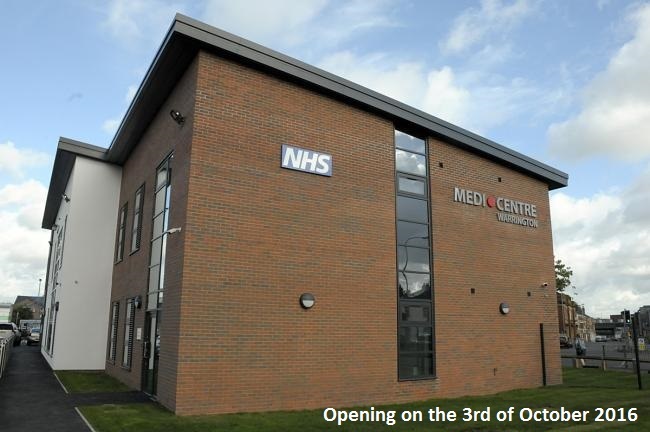 The Medi-Centre Warrington is a newly built (2016), state of the art , world class Healthcare premises in the Town centre of Warrington on Tanners Lane. This building not only houses the main site of the Eric Moore Partnership Medical Practice, but also has been built with a view to have the ability to host an array of complex specialist services and investigations in the community, closer to your homes that otherwise would have meant a visit to the hospital. 9. An MRI Scanner Docking station in the car park. 10. Patient exercise rooms/Group Therapy sessions. The Medi-Centre is easily accessible from Warrington Bus station and central train station, both of which are a 2 minutes walk. In addition the facility offers an in house Pharmacy as well as free parking for our patients with appointments. As part of supporting the future vision of evolving Healthcare services, The Medi-Centre Warrington, shall work with local commissioners and healthcare partners in supporting and hosting advances services in the community, with an overall aim of enhancing the health and wellbeing needs of the local community. The facility has free WiFi and a Learning/Drawing area for children/toddlers as well as advanced technology enabled self monitoring units for self measurements of BP, Height, Weight and BMI that directly transmits the results to your patient record for registered patients.